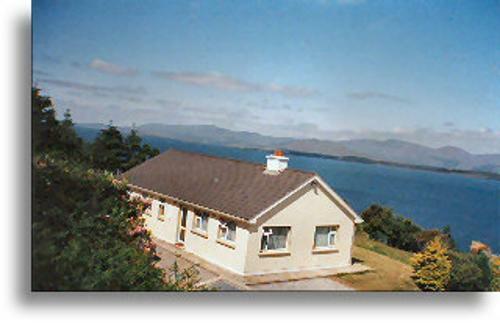 Self-catering Holiday Home on the most spectacular location on the Kenmare Bay. Offering a delightful spacious bungalow situated on the seafront. A popular area to spot seals, dolphins and rare birds. A great location to explore the Ring of Beara and the Ring of Kerry from. Available all year round. and 1 single, both with basins, orthopedic beds, bed linen and towels supplied. Lawned garden with furniture and private parking. Sorry, No pets. from the bungalow where mackerel and pollock are in abundance. The area is also popular for spotting dolphins and seals and some rare birds. Nearby located: waterfalls and amenity area, stone circles, sea cruises and shops. Pony trekking, old world charm pubs, gourmet restaurants, golfing, post office and phone. The well acclaimed Derreen Gardens and Healy Pass are just around the corner. This is an ideal base to tour the famous Ring of Kerry and the Ring of Beara. Distance by car : Dublin airport – Ferryport = 220 miles (5 and a half hours by car). Cork Airport – Ferryport = 72 miles (2 hours by car). Shannon Airport = 120 miles (2 hours and 45 minutes by car). Kerry International Airport = 42 miles ( 1 hour and 20 minutes by car). Rosslare Ferryport = 200 miles (5 and a half hours by car).